You read that title correctly — buy 1 mousepad and get 2 free! 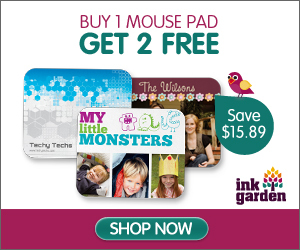 For a limited time, Ink Garden has this promotion which will get you 3 mousepads for the price of one! You will need to enter the coupon code 2FORFREE at checkout for the discount to be applied to your order. *You will have to pay shipping on all 3 mousepads, which is $4.99 for your first mousepad and $1.49 for each additional one ordered. « Reader’s Digest Only $6.89 A Year!